We are delighted to announce that our Park Crescent project has won Best Extension in the 2016 Real Homes Transformation Awards. 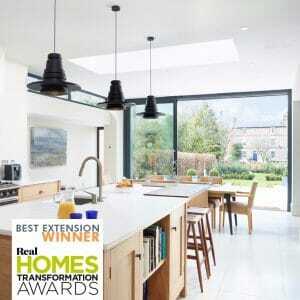 The judges were extremely complimentary about the extension and the transformation of our clients home. Judge Wayne Hemingway was moved to remark, ‘This extension is really beautifully finished inside and out. The dark metal work contrasts excellently with the red brick façade and marries beautifully with the dark gabling. © 2005-2019 Allister Godfrey Architects is a trading style of Allister Godfrey Architects Ltd.